As the minority leader of the Senate, Godswill Akpabio, is reportedly planning to leave the Peoples Democratic Party (PDP) for the All Progressives Congress (APC) the lawmaker has met with Yemi Osinbajo, the country’s vice president. Daily Trust reports that Akpabio, a former governor of Akwa Ibom state, arrived the State House Villa by 3.06pm with Ita Enang, an aide to President Muhammadu Buhari on the National Assembly (Senate). The report said Akpabio and Enang got to Aso Rock an hour after President Muhammadu Buhari departed for Bauchi state on an official engagement. 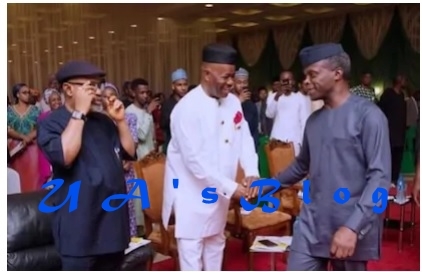 Ujuayalogu'sBlog learnt that the meeting between Akpabio and Osinbajo lasted for about two hours. Even though details of the meeting were not known, it is believed that it could be related to Akpabio’s planned defection over his rift with the current governor of Akwa Ibom, Udom Emmanuel. Coincidentally, the Peoples Democratic Party (PDP) which Akpabio currently belongs, held its National Executive Council (NEC) on Thursday, August 3. Senate President Bukola Saraki and other defectors from the APC attended the meeting. The report quoted a top ranking senator as saying that Akpabio had perfected his plans to dump the PDP. “If not for the impunity of Saraki, he (Akpabio) would have announced his defection penultimate Tuesday when we proceeded on recess. He was to announce it that day but Saraki stopped him,” the senator reportedly. Akpabio would be the second senator to join the APC from the Niger Delta. Senator Nelson Effiong from Akwa-Ibom South had earlier joined the APC from the PDP. The report said Enang refused to respond to a text message asking if the meeting Akpabio held with Osinbajo was part of the former’s defection plan. We earlier reported that the Peoples Democratic Party was said to have made frantic efforts to dissuade Senator Godswill Akpabio from defecting to the All Progressives Congress (APC). The senator is reported to have fallen out with his successor, Governor Udom Emmanuel, and the PDP is making effort not to lose him. A PDP source told the Nation that the national chairman of the party, Prince Uche Secondus, was locked in a marathon meeting with Akpabio in his Asokoro Abuja home at the weekend over the issue.